Talmudic author and liturgical poet of the twelfth century; disciple of Moses ben Joseph of Narbonne. Azulai and many others, influenced by the statement of Zacuto ("Sefer ha-Yuḥasin," ed. Filopowski, p. 218) that Zerahiah completed in 1150 his "Sefer ha-Ma'or," which he is known to have begun at the age of nineteen, give 1131 as the year of his birth. This date can scarcely be correct, however, since the "Sefer ha-Ma'or" mentions the commentaries of Jacob Tam and Samuel ben Meïr, which could not have been known so early in Provence. It is equally improbable that he died in 1186, as is asserted by Judah ibn Verga ("Shebeṭ Yehudah," ed. Hanover, p. 112). Zerahiah belonged to a prominent Spanish family called Yiẓhari of Gerona, but early in life he left his native place, where he seems to have had many enemies, and settled at Lunel. There he appears to have devoted himself to teaching, his pupils including Samuel ibn Tibbon, son of Judah ibn Tibbon, who, in his ethical will, freely recognized Zerahiah as a greater scholar than himself. Zerahiah was not only a thorough Talmudist of great erudition, with an analytic and synthetic mind, but he was also deeply versed in Arabic literature, in philosophy,and in astronomy, and was, above all, a gifted poet, combining elegance of style with elevation of sentiment. 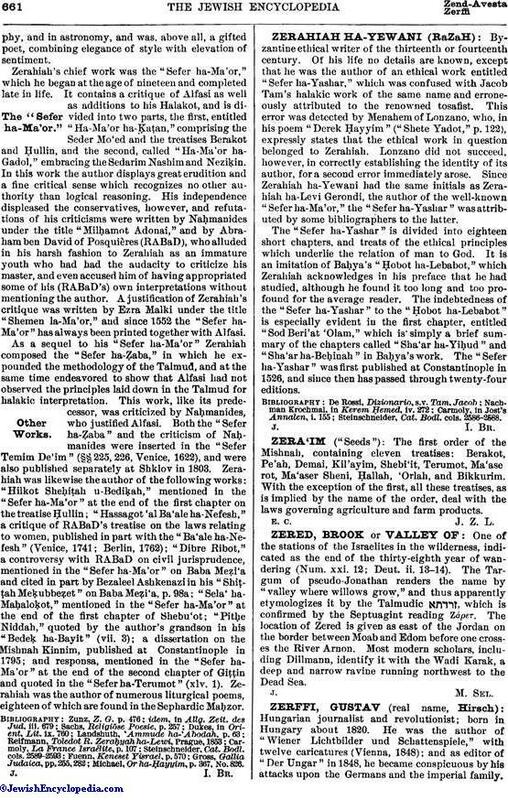 Zerahiah's chief work was the "Sefer ha-Ma'or," which he began at the age of nineteen and completed late in life. It contains a critique of Alfasi as well as additions to his Halakot, and is divided into two parts, the first, entitled "Ha-Ma'or ha-Ḳaṭan," comprising the Seder Mo'ed and the treatises Berakot and Ḥullin, and the second, called "Ha-Ma'or ha-Gadol," embracing the Sedarim Nashim and Neziḳin. In this work the author displays great erudition and a fine critical sense which recognizes no other authority than logical reasoning. His independence displeased the conservatives, however, and refutations of his criticisms were written by Naḥmanides under the title "Milḥamot Adonai," and by Abraham ben David of Posquières (RABaD), who alluded in his harsh fashion to Zerahiah as an immature youth who had had the audacity to criticize his master, and even accused him of having appropriated some of his (RABaD's) own interpretations without mentioning the author. A justification of Zerahiah's critique was written by Ezra Malki under the title "Shemen la-Ma'or," and since 1552 the "Sefer ha-Ma'or" has always been printed together with Alfasi. As a sequel to his "Sefer ha-Ma'or" Zerahiah composed the "Sefer ha-Ẓaba," in which he expounded the methodology of the Talmud, and at the same time endeavored to show that Alfasi had not observed the principles laid down in the Talmud for halakic interpretation. This work, like its predecessor, was criticized by Naḥmanides, who justified Alfasi. 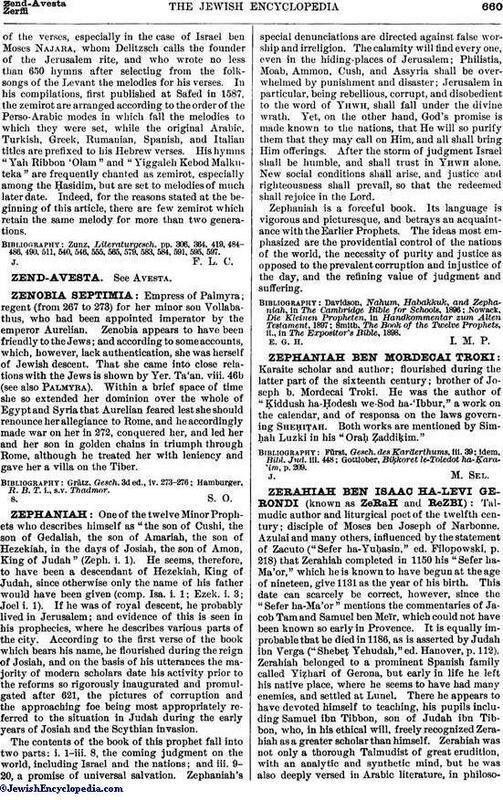 Both the "Sefer ha-Ẓaba" and the criticism of Naḥmanides were inserted in the "Sefer Temim De'im" (§§ 225, 226, Venice, 1622), and were also published separately at Shklov in 1803. Zerahiah was likewise the author of the following works: "Hilkot Sheḥiṭah u-Bediḳah," mentioned in the "Sefer ha-Ma'or" at the end of the first chapter on the treatise Ḥullin; "Hassagot 'al Ba'ale ha-Nefesh," a critique of RABaD's treatise on the laws relating to women, published in part with the "Ba'ale ha-Nefesh" (Venice, 1741; Berlin, 1762); "Dibre Ribot," a controversy with RABaD on civil jurisprudence, mentioned in the "Sefer ha-Ma'or" on Baba Meẓi'a and cited in part by Bezaleel Ashkenazi in his "Shiṭṭah Meḳubbeẓet" on Baba Meẓi'a, p. 98a; "Sela' ha-Maḥaloḳot," mentioned in the "Sefer ha-Ma'or" at the end of the first chapter of Shebu'ot; "Pitḥe Niddah," quoted by the author's grandson in his "Bedeḳ ha-Bayit" (vii. 3); a dissertation on the Mishnah Kinnim, published at Constantinople in 1795; and responsa, mentioned in the "Sefer ha-Ma'or" at the end of the second chapter of Giṭṭin and quoted in the "Sefer ha-Terumot" (xlv. 1). Zerahiah was the author of numerous liturgical poems, eighteen of which are found in the Sephardic Maḥzor. Michael, Or ha-Ḥayyim, p. 367, No. 826.